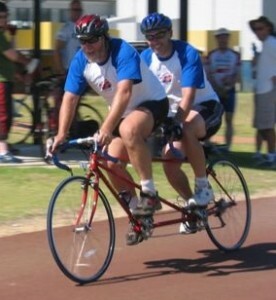 Welcome to the Western Australian Tandem Cycling Advisory Council’s website. You can call us WATCAC for short. The purpose of WATCAC is to promote the integration of blind and vision-impaired cyclists into the cycling mainstream. WATCAC organises recreation rides, club rides and also participates in community cycling events. For more details see About Us. Also check out our Facebook page for updates. For information on the sad loss of six of our tandems, please click here. See the video story of Kate and Roland’s “Good Ride”, participating in Landcorp’s , raising money for Dreamfit.